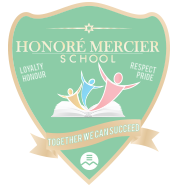 Honoré Mercier offers all children attending our school (kindergarten to grade 6) the Before And After School Enriched (B.A.S.E.) Daycare service. The school provides early entry, lunch and after school daycare services. Such services provide our students with activities and educational projects that develop their intellectual abilities and their social skills such as respect and cooperation. The daycare also provides a homework support program. Students also participate in recreational activities such as arts and crafts, computers, drama club, cooking club, building club, card playing and board games. Organized sports activities such as soccer, hockey, basketball and dodge ball are also enjoyed by the children. In addition, the daycare offers various field trips (sugar camp, apple picking, IMAX, etc.) or “special days” (Mad Science, Carnival, Pyjama Party, etc.) which are organized on pedagogical days throughout the school year. B.A.S.E. daycare is open to all students on Pedagogical days. However, advance registration is required for your child to attend on those days. For pedagogical days, the daycare organizes various activities to ensure that the children have a fun day off from school. For more information regarding our daycare, please contact our daycare coordinator, Ms. Daniela Buttino at (514) 323-4023. Please note that the daycare closes promptly at 6:00 p.m. An additional fee of $1.00/minute will be added to your statement for late pick-ups. Daycare is not available during daycare staff professional days, spring break, statutory holidays and the summer. Regular: A registered student attending daycare for a minimum of 3 days a week and a minimum of 2 periods per day. Lunch fee is included when student attends morning or afternoon period. Sporadic: A registered student attending daycare less than 3 days per week and/or less than 2 periods per day. Lunch fee is not included.